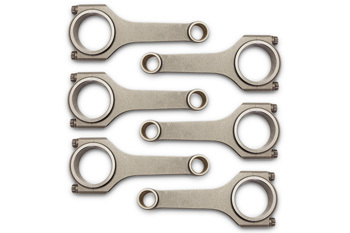 We are pleased to bring you our economical VAC Forged Connecting Rods for the S38 engine. These rods are made from 4340 forgings and feature a fully machined I-Beam design that is not only light, but also very strong! We know if cost were a non issue everyone would chose our Arrow Precision H-Beam Connecting Rods, but if they are out of your budget, don't hesitate to consider our VAC Connecting Rods made just for us by our friends at Manley. Great for taking your S38 to the next level.